Simona Halep defeated Madison Keys in Sunday’s Montreal final, 7-6(2) 6-3. The match, in terms of the quality of tennis, was not one for the scrapbook! Halep twice failed to serve out the first set but held on in the first set tiebreak, which was decided entirely by errors. The quality was marginally better in the second set with Halep playing a very tidy set including a series of confident service holds, not allowing Keys to wrestle back any momentum. Halep had a superb week with four wins over players she had lost to in their previous meeting in 2016. Halep is now on a ten match winning streak and will next play in Cincy… Congrats, Simona! Ekaterina Makarova and Elena Vesnina defeated Simona Halep and Monica Niculescu in the doubles final, 6-3 7-6(5). While it wasn’t the result I was hoping for, Eugenie Bouchard’s 6-3 3-6 7-6(3) win over Lucie Safarova was a thoroughly entertaining match. There were some sensational shotmaking towards the end of the match. Here are two crackers from the Bouchard-Safarova match. The first shot, a terrific passing shot from Bouchard in the final set tiebreak, helped the Canadian on her way to match point. The second video is linked to a fabulous forehand down-the-line winner from Safarova in a precarious position at *4-5 *15-30 in the third set. Here’s another super point from Bouchard during her second round win over Dominika Cibulkova. An awesome forehand winner from Madison Keys on match point in her semi-final match against Kristina Kucova. V.Williams v Strycova was one of the worst matches i’ve watched all year but this was brilliant from Bara! Another good week for Pavs, here’s a hot shot from victory over Agnieszka Radwanska. Loved this from Christina McHale. ICYMI: I was writing for Women’s Tennis Blog this weekend, recapping the semi-finals and final in Montreal. Racket Rally: Unfortunately it seems that RR has died so I won’t be providing any more updates. 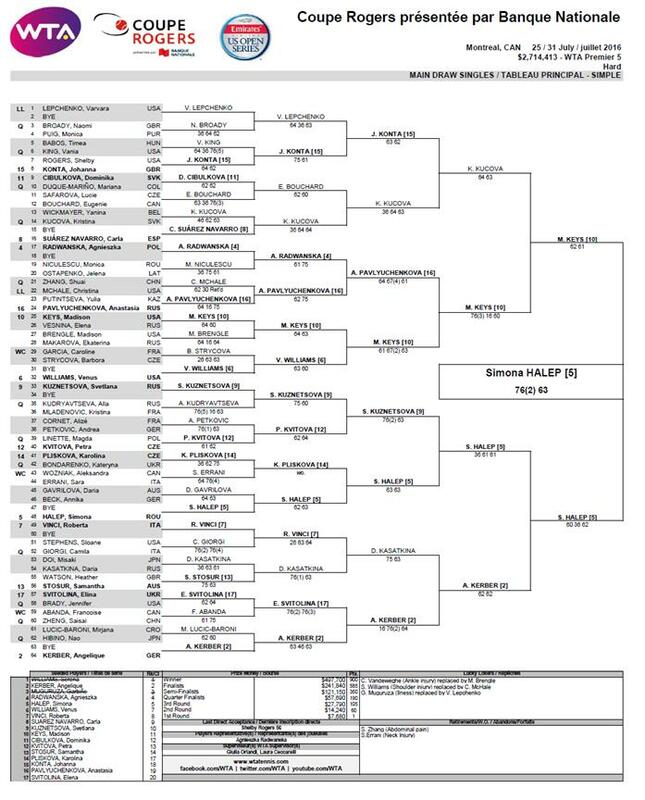 Tennis Draw Challenge: Congrats to tweissinger97 who correctly predicted a Halep-Keys final to win Montreal in the Moo’s Tennis Blog league. More details on how to join can be found HERE. August 1, 2016 in Match Points, Montreal, WTA. This has been a very disappointing season for Radwanska, she hasnt won anything besides Shenzen, she has started losing to pretty much anybody who hits hard! Radwanska started the season so well and I was impressed by her scheduling in trying to peak for the big events. It has all gone a little pear shaped since the French Open. Wimbledon was tough, the match vs. Cibulkova was brutal. Perhaps a little mental fatigue coming in, I thought she didn’t really look up for the battle vs. Pavs in Montreal. I think a large part of the problem with Aga is that her opponents are getting better, especially the younger ones. 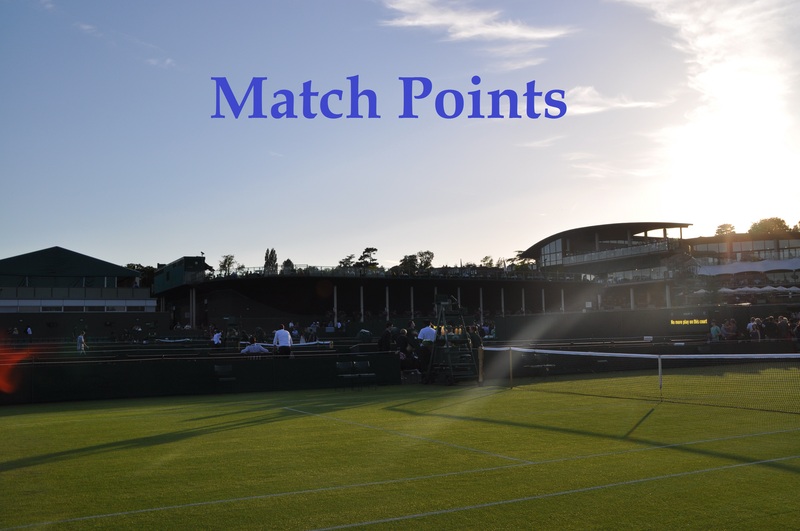 For example, CoCo Vandeweghe, who beat her in Birmingham, is a very good grasscourt player now, Domi seems to have cut down on the number of mistakes she makes and doesn’t overhit as much as she used to, and Pavs has improved a lot over the last year with her new coach and when she’s playing well is a tough nut to crack on court now (her last coach helped her improve as well). At the same time, Aga is finding it hard to find areas of her game where she can improve; she is already so good in most respects that she doesn’t have a lot of room to get still better, and her main problem as she admits herself is her lack of power. In Miami recently, Timi Bacs beat her at her own game – clever tennis – by exploiting this lack of power. Timi hit a lot of high, looping balls with all the power taken off so that Aga couldn’t use the power of Timi’s shots to help generate pace for her own returns. I wonder if any other of her opponents (or their coaches) have taken notice of this match. If I were her coach I’d be trying to work out how to counter Timi’s tactic as someone else might try it (or Timi might do it again) and it’s clearly one she finds hard to deal with. Good point about Bacsinszky in Miami. That match surprised me because as you say, Timea did seem to beat Aga at her own game with the variety. Her game is quite tasking, mentally and physically so once any of that goes off the boil she will have problems. I thought that she surprised herself by her performance at the French but, emotionally, she let herself down after that loss to Pironkova. It soured her mood and likely her outlook for upcoming games. Granted she is good on grass, I was surprised by how quickly she wanted to leave the dirt behind and embrace the grass. That grinder with Cibulkova surely must have knocked some of the stuffing out of her as well. With Aga, you either have to play right through her or beat her at her own game( Timea, outfox or Cibulkova, outhit, out move). The latter being the more difficult path I suppose. It gets easier if she is not at peak tennis or fatigued. At this point, scheduling is of prime importance, she will have to find a way to get mind body spirit in tune again before YEC. It is the only way since her game style doesn’t give her freebies to coast against opponents. Even more thrilled that Serena has now (or will shortly) record the longest consecutive run at #1 on the WTA, since Kerber has no way of overtaking her until the US Open finishes, if she will at all. I haven’t been following the race for number one too closely but if Serena commits to playing some tournaments in Asia then I’d be surprised if she doesn’t finish the year as No.1 defending nothing after the US Open. If she wins the US Open and the Year End Championships then she probably doesn’t even need to play Asia. Yeah agree, Singapore is the big one as so many ranking points on offer. I think Serena will end the year as number 1. I do too. I think Kerber has been impressive to make it this close though! And she could potentially make it even closer if she plays well at the US Open, an event she has had successes at already. Me too. I think Serena would have to flop badly at Cincinnati (where she’s defending a title) and the US Open to lose her #1 ranking, and I can’t see it happening; in fact, I think she’s going to win slam #23 at Flushing Meadows this year. Pretty sure Serena isn’t on the entry list for Cincy. I thought Serena and Venus were both skipping Cincy because they want to attend the Olympics Closing Ceremony. Yes, I was also under the assumption they were missing Cincy but more likely to recuperate. What do I know, the Olympic Closing Ceremony might be something special. Think that, too. I was betting on Garbine at the beginning of the year though 🙂 Never expected Angie to play that well. I thought Bencic had the best chance but she’s struggled this year. I’m positive that she’ll bounce back next year though. The year end championships this year could be very interesting because the top 12 have all shown moments of magic. Especially with Halep finding some form. It’s a great top 4! I stand corrected re Serena; I thought she would be defending her title at Cincinnati. I was delighted for Simona though; I thought she’d overdone it playing both doubles and singles at Montreal and wouldn’t have enough left in the tank for the final, but clearly I was wrong (even though by her own admission she wasn’t at her best that day). James and let’s play; good points about Aga. I thought both she and Simona were justified in their complaints about having to play in wet and heavy conditions at Roland Garros, conditions which could easily have aggravated injuries both players have been struggling with in the past (with Simona it was her back, and Aga her wrist). She’s defending a lot of points in Asia (she won in Tokyo last year, and got a title in Shenzhen in China as well), so she’ll need to be in good form to make it to the YEC. I expect she will as she usually does well in the Asian swing. Plenty of men have been #1 without winning a slam. Being #1 means you have a level of consistency that others dont have. When Wozniacki was #1 she won a lot of titles and a lot of matches, same with Jankovic and especially Safina, who is a very underrated player.